The south-eastern part of the Tibetan Plateau is a region of stunning high mountain scenery and fascinating people. Travelling in the region we'll discover immense monasteries and settlements devoted to Tibetan Buddhism and visit the Tagong grasslands for the annual Horse Festival, a demonstration of bizarre equestrian skills and a general all round celebration. This morning we head to the outskirts of the city to meet Chengdu's most famous residents, the giant pandas. The pandas are said to be China's spoilt children and they spend their days relaxing in large enclosures while the staff bring them bamboo by the bucket load. The centre works hard to breed the pandas with the ultimate aim of releasing them back in to the wild. We return to Chengdu to discover the Wenshu Temple. Built during the Tang Dynasty, the monastery is home to more than 500 paintings and calligraphy exhibits as well as over 300 Buddha statues. We'll depart Chengdu in the afternoon for an hour's drive to Dujiangyan. Set amongst beautiful landscape, the 2300 year old Dujiangyan irrigation project is one of the greatest engineering feats of the Qin Dynasty. Constructed to provide water to the region and control flooding, the system is still in use today. Nearby, we also discover the Two Kings Temple and the Dragon Taming Temple, impressive and ornate examples of traditional Chinese architecture, each with its own mysterious and ancient legend. Leaving Dujiangyan we head for Ma Er Kang, a drive of around six hours through beautiful countryside of rolling hills and grassland plains. We'll stop at a couple of villages and viewpoints along the way including Zhuokeji village which was built in the 18th century and has very well preserved stone and wooden houses. The town of Ma Er Kang follows the Dge-lugs-pa or Yellow Hat sect of Tibetan Buddhism observed by the Panchen and Dalai Lamas, and is known for its clear air and surrounding snow capped peaks. We start today at nearby Songgang where 17th century watch towers which once signalled villagers of impending raids. 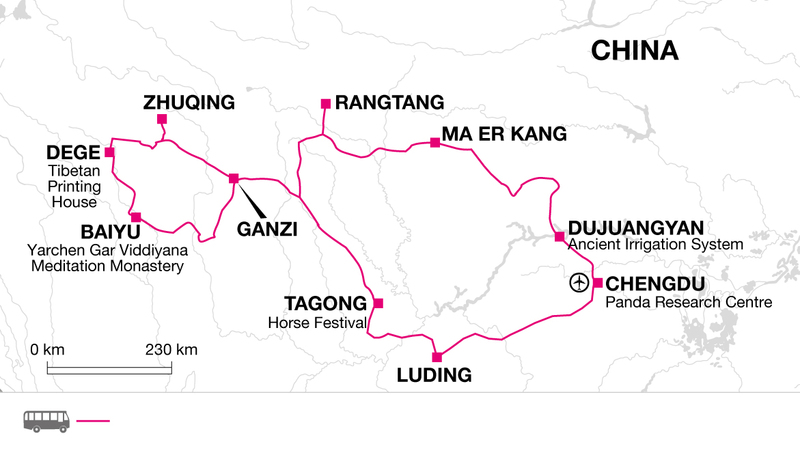 We continue towards Rangtang, a journey of five to six hours through the Dukehe River Valley. There'll be several stops to enjoy the mountain scenery and explore some of the villages and temples along our route including Kalong, a beautiful mountain village, and Zengke Temple, a small ancient Tibetan Buddhist temple with 50m high towers and over 1100 stupas. Day 5 - Rangtang Monastery and Tibetan village. An hour's drive takes us to Rangtang Monastery which is the centre of the Jonang school of Tibetan Buddhism. Originating over 900 years ago, the followers of Jonang believe that only the mind is real and everything we perceive is purely a product of consciousness. We'll meet the lamas and learn something of the fascinating Jonang tradition. The monastery itself consists of three temples which were all built in different eras, with the oldest being the Querji Temple which dates from the 14th century. There is a small village near the monastery and we'll wander through it's streets getting a first hand experience of the way of life of the Tibetan Buddhists that live there. On the way back to Rangtang we stop at Bangtuo Monastery. The name means 'monastery on the grassland' and it is built on hillside facing the Zequhe River in a beautiful natural setting. It is famous for its 300 year old stone carved Tibetan Scriptures which took over 60 lamas nine years to finish. We drive to Ganzi, which translates as 'a pure white and beautiful place', a drive of around seven hours through landscapes of long mountain ridges and deep river valleys. On the way we'll pay a visit to Shounig Monastery in Luhou. Shouning Monastry, a yllow hat sect Buddhist monastery, first built in 1650, moved the location for three time in the hstory, and the present one is finished in 1988, there are over 200 lamas in residence and young people from the surrounding areas visit to learn from them. We also spend some time at Qiuran Tibetan village, visiting one of the traditional wooden houses that make up the village and learning about the Tibetan culture and way of life. Situated in a large valley of grass-covered hills with snow-capped mountains in the distance, the friendly town of Ganzi is rich in Tibetan culture. We walk through the town for around an hour, making our way to Ganzi Monastery which is reached by almost 200 steps. Built in 1642 by Mongols who took control of the area, the monastery was partially destroyed during the Chinese revolution and renovated during the 1980's assimilating both Chinese and Tibetan influences; it is now home to around 700 monks. We'll explore the temples, the kitchen, and the Buddhist college before stopping for a while at the local vegetable and food market in the town. Today's drive takes us through Zhuodala Tunnel and via spectacular scenery of mountains, lakes and expansive grasslands. We stop for a couple of hours at the Yarchen Gar Viddiyana Meditation Monastery, a large monastery settlement situated at 4000m. It is home to more than 10,000 lamas, monks and nuns, with a majority of nuns. The monastery is dedicated to the Nyingma tradition of Buddhism. This is the most ancient of the four schools of the religion and its teachings are derived from the first translations of Buddhist scriptures from 8th century Sanskrit sources. The lamas and nuns spend eight months of the year teaching, and four months practicing meditation. Our drive takes around eight hours including the stops, and just before arriving in to Baiyu we'll pass through a large grassland area which is carpeted with a wonderful variety of different coloured flowers, before following the river valley in to the town. After breakfast we set out to walk through the town of Baiyu and up to the monastery that overlooks it, reached by around 150 steps. We'll continue up to the Mandala Temple for great views across the monastery and the town, and spend some time at the Buddhist college where we can meet the lamas that teach the principles of the religion to devotees. Our three hour drive this afternoon follows the course of the mighty Yangtze River, stopping at several traditional villages along the way, until we reach the town of Dege. Dege means 'land of mercy' in Tibetan and is one of three ancient centres of Buddhism. We take a short walk through the small town and spend a couple of hours visiting the renowned printing house. Often described as an 'encyclopaedia of Tibetan culture', Dege Printing House contains more than a quarter of a million wooden printing blocks of text and images. They cover all aspects of culture including geography, medicine, arts and religion, and provide a unique insight in to the view of the world of the region's people. The collection also includes some of the rarest Tibetan texts in existence. The block printing process still practiced here has remained unchanged for the past 300 years and we'll be able to witness it in progress while we are there. In the afternoon we visit the Gengqing Monastery which was built in 1448 and has a collection of seven smaller monasteries attached to it. They follow the Sakaya school of Buddhism, with a particular focus on scholarship and teaching the Lamdre, or 'path with its fruit', meditation. We'll also spend some time at the workshop of a local Tangka painter where we'll learn how these elaborate, and sometimes enormous, works of Buddhist art are created for decorative and ceremonial purposes. Our eight hour journey today will take us through spectacular high mountain scenery. We'll stop at some of the small Tibetan villages that we pass through and take time to enjoy the beautiful 4000 metre high Xinluhai Lake. The last part of the journey takes us across vast grasslands where we will stop to meet the nomads with their huge herds of Yak before reaching Dzogchen Monastery, where we will be spending the night in the Monastery's guest house. Run by the monks and nuns, our fellow guests are likely to be monks or lamas visiting from other parts of China. This morning we take atour of the Dzogchen Monastery. Set in stunning scenery at an altitude of 4000m, it was one of the six great monasteries of the earliest sect of Buddhism known as Nyingma. We'll see the temples of the monastery, its Buddhist college, and meet the Lamas who come from both the Tibetan region and other parts of China. We'll be able to take part in a walking meditation with the locals, circumnavigating the monastery in the Buddhist style. In the afternoon we take a drive of four hours to Ganzi. Just before we arrive, we visit the small Dajin Monastery, set in spectacular countryside just outside the town. Dajin means 'lucky and prosperous land' in Tibetan and the monastery was built 350 years ago as a copy of the Johkang Temple in Lhasa. Once there were around 3000 lamas in residence but today it is just a few hundred. From the top of the three story structure we'll get views of snow-capped mountains and the glorious scenery of the area. We have a leisurely eight hour drive to Tagong along mountain roads and passing through more incredible scenery. On the way we'll stop for a while at Lingque Monastery in Daofu. The monastery follows the Gelug tradition of Buddhism that is led by the Dalai Lama and is famous for its butter sculptures, a tradition that arose from the practice of nomads donating the first butter from each yak as an offering to the Buddha. Over time the sculptures became larger and more elaborate and now the biggest can be several storeys high. We will also take the opportunity to stop at some of the nomadic communities that we are likely to pass. Renowned for their hospitality, they welcome visitors and will offer us sweet treats and butter tea as we learn a little bit about their ancient, wandering lifestyle. In the local tongue the word Tagong means 'favourite place of one that has achieved enlightenment' and is famous for its massive grassland areas inhabited by tens of thousands of yaks and their herders. Visiting the Tagong Horse Festival offers one of the best opportunities to witness authentic Kham culture and mix with the nomads. Held every year on the 15th day of the fifth lunar month of the Tibetan calendar, the nomads gather to race horses, enjoy other nomadic sports, and traditional singing and dancing. Events include various horse races, horsemanship competitions such as picking up an item from the ground while travelling at speed, and performing gymnastics on horseback. The festival attracts local people from the surrounding villages, and takes place in a beautiful setting with a backdrop of towering mountains. We'll spend more time at the festival today and enjoy some of the other events such as tug of war and the sandbag carrying competition. We can also witness the lamas chanting and offering prayers for the wellbeing of all the local population. Later, we take the opportunity to visit the Tagong Monastery, built during the Qing Dynasty to honour the journey of Princess Wencheng who stayed here on her way to Lhasa to marry the king of Tibet. The monastery houses sacred relics and statues and has a very impressive setting, with snow-capped mountains providing a stunning backdrop to its golden roofs. This morning there will be a performance of traditional Tibetan Guozhuang dancing. The dance reflects themes in daily life and is often performed at festivals. An equal number of men and women form a circle around a lead dancer, following their steps and singing folk songs. After the dance, we depart for Luding, a drive of around four hours. A small, lively town, it is famous for its narrow centuries old suspension bridge, and the site of what is considered by many to be one of the most important events of the Long March, the Battle of Luding Bridge. The battle saw the Red Army taking the narrow bridge against superior numbers after a forced march of 120km in less than 24 hours. On arrival we'll take a walk through the town and along the Daduhe River to the bridge and the site of the battle. Today we return to Chengdu via Ya'an, a drive of around seven hours. Ya'an is known as a centre of the tea industry and was an important stop on the ancient Tea and Horse Trail, an ancient trading route from China to Tibet. We'll stop here for lunch and visit Ya'an museum to learn about the trail and the tea production of the area. Arriving in Chengdu in the late afternoon we'll have the opportunity to try some of the city's renowned cuisine on our last night in China. It is best to pack lots of layers for this tour, as although day time can be warm, temperatures can fall to below zero at night and even during the day whilst at higher altitudes. It can rain, sometimes heavily, at this time of year so a waterproof is useful. Comfortable shoes that are good for walking are recommended. The maximum altitude on this trip is 5050m. At altitudes in excess of 3000m you may find that you get out of breath more quickly than usual and occasionally your sleep can be affected. You should ensure that your travel insurance covers you for travelling at this elevation. The Tagong Horse Festival provides a great opportunity to experience authentic nomadic culture in the beautiful mountain region of ancient Kham. The three day event attracts people from all over the area to watch and take part in the celebrations. Horse races and displays of equestrian skill take centre stage, while there are nomadic challenges such as carrying the sandbag and tug of war, and singing and dancing performed by the people of the town. Monks and nuns from the nearby monasteries also attend, not only to watch but also to offer prayers for the participants.